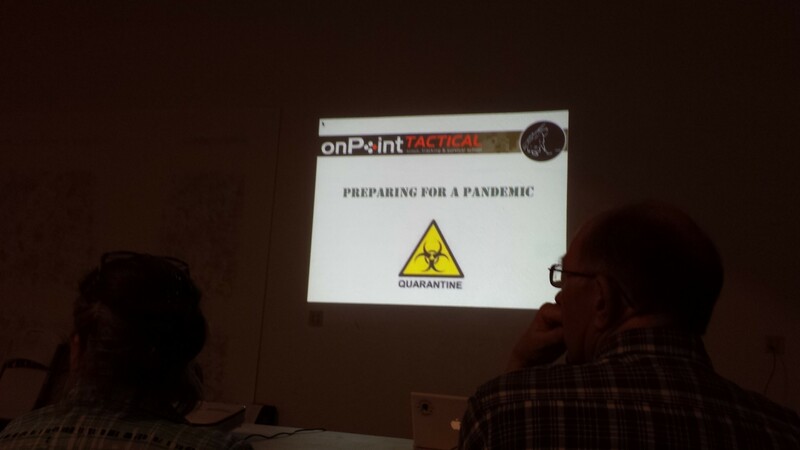 DIAMOND VALLEY – More than 100 people turned out at the old Diamond Valley Fire Station Tuesday night to learn how to survive a pandemic. 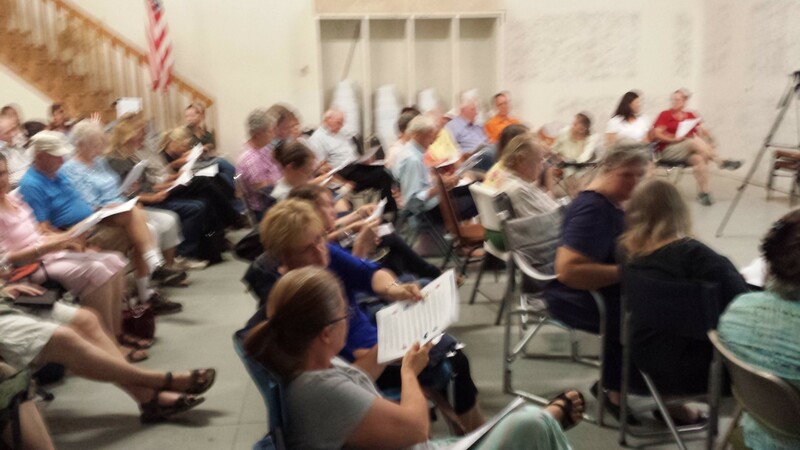 The class was prompted by the recent outbreaks of the Ebola virus in various parts of the world. According to the World Health Organization website, more than 1,711 confirmed cases of Ebola have resulted in 932 deaths as of Aug. 4. Ebola virus disease – formerly known as Ebola hemorrhagic fever – is a severe, often fatal illness with a case fatality rate of up to 90 percent. It is one of the world’s most virulent diseases. The infection is transmitted by direct contact with the blood, body fluids and tissues of infected animals or people. The outbreak of Ebola virus disease in west Africa continues to evolve in alarming ways, with no immediate end in sight. Many barriers stand in the way of rapid containment. The most severely affected countries, Guinea, Liberia, and Sierra Leone, have only recently returned to political stability following years of civil war and conflict, which left health systems largely destroyed or severely disabled. On Aug. 8, WHO declared that the recent Ebola outbreak — the largest and longest in history — is worrisome enough to merit being declared an international health emergency. WHO declared a similar emergency situation for the swine flu outbreak in 2009. In the United States, the Centers for Disease Control and Prevention has already elevated its Ebola response to the highest level and has cautioned against traveling to West Africa. On Aug. 7, CDC director Dr. Tom Frieden stated at a congressional hearing that the current outbreak is set to sicken more people than all previous outbreaks of the disease combined. Frieden also told the congressional panel the U.S. could expect isolated cases, but well-prepared hospitals could prevent a widespread epidemic. Kevin Reeve, with OnPoint Tactical, has been teaching survival for almost 20 years and has been teaching scouting, tracking and urban survival to Navy SEAL teams and Special Forces groups. After what his company witnessed during Hurricane Katrina, it was decided that OnPoint Tactical would expand its services to the civilian market. Reeve began the meeting by stressing that the mortality rate of Ebola is between 60-95 percent. He then contrasted Ebola with the 1918 Spanish flu pandemic, which killed between 50 million and 100 million people; Spanish flu only had a mortality rate of between 2.5-5 percent. Reeve said pandemics happen about every 60 years, with the last one being in 1918. Currently, if you have traveled to any country and come back to Washington County, you are on a 21-day watch. We already do a good job of protecting and doing what we can right now. Reeve said he recently read an article that stated in many of the African countries where Ebola virus disease is rampaging, the health care workers, such as doctors and nurses, have died of exposure or have left to avoid dying of exposure. The article also said people who fear they are getting sicker in the hospitals are leaving and spreading it out into the population. Reeve said the only sure way to prevent the disease is through isolation, social distancing, or what used to be called self-imposed quarantine. Reeve said the island kingdom of Samoa did not lose a single person or experience a single exposure due to Spanish flu because the residents isolated themselves. They shut down their ports and allowed people to leave the island, but no one was permitted onto the island. Reeve said people need to get ready now and will have to address food, water, medical needs, sanitation and being able to defend themselves for 90 days. In some areas, utilities may remain functional for 90 days; in other areas, they may not, Reeve said, and people need to be prepared for that. Reeve said if less than 10 percent of the workforce calls in sick, it could crash utility operations and other vital infrastructures. Reeve said his family’s SOP is to move indoors and not have physical contact with anyone. Reeve said he has a border around the perimeter of his home – a chain link fence and a wall. Reeve said he will defend his border by any means necessary. “If you come over my fence, you will be challenged,” he said. Reeve said the only exception is family members. If a family member arrives during isolation, you should quarantine them outside for 21 days to make sure they are not infected, then you can allow them into your home. Reeve said this person’s job is to interact with anyone outside the border without getting close. The “outside man” handles all the logistics. The family puts the trash and waste outside in a “sally port,” or buffer zone, and the outside man takes care of it. He has no contact with the people inside the home. If the people inside the home need or run out of something, the outside man tries to locate it for them. “The people who volunteer to do this job are heroes,” Reeve said. These outside people will coordinate with other outside people, without close contact, to ensure the survival of the people inside the home. This way, community members can still interact and survive while in isolation. I think it is important to let people know what is going on but I think you went overboard with this article. This is great. Likely would have been 1000 there if this had been well advertised. Offer it again and advertise it please. “If you come over my fence, you will be challenged” – when I read this I heard it in Dan Aykroyd’s voice. and see what the scientists have to say. Actually, the page you linked to has misinformation on it. Ebola CAN be transmitted through contaminated food or drinks, because it is transmitted by bodily fluids (like saliva flying through the air, as in the article linked above). If someone that is sick coughs or spits in food or drink, and someone else eats that food or has contact with it, of course they can get sick. Additionally, the Ebola virus can survive for hours or even days on a cold, hard surface. And there is little comfort in people not being contagious until they have symptoms, because people go to work, church, shopping, movies, etc all the time with headaches, fevers, weakness, etc. The CDC and US media are colluding to downplay Ebola, but thinking it can’t come to America is pride, arrogance, and ignorance. If you think we’re beyond the reach of pandemics, you’re nuts. On a related note, has Obama knocked on your door yet and demanded all of your firearms? Read this part slower, see if it sticks: “Ebola CAN be transmitted through the air, just in liquid drops. So it isn’t truly airborne, but its false to say it can’t be transmitted through the air.” The CDC is trying to make people feel safe on airplanes, but the truth is you can easily catch Ebola from someone 5 rows away from a sneeze or a cough. This is not “airborne”, but the virus did travel through the air, not through direct physical contact. That’s the truth, and there is nothing hysterical about it. Brian’s floppy intellect is a prime example of why we have people that believe in chemtrails, faked moon landing, ear candling, homeopathy and a foreign born president. Despite language that could not be more clear — “Ebola is not suddenly an airborne disease” — Brian is convinced that he has a deeper understanding of the issue and assures us that, in fact, the opposite it true. No, at the moment it cannot. The reason is that ebola does not infect the upper respiratory system, there aren’t enough viruses in the throat and lungs to get into the droplets one caughs or sneezes out. While the enlisted methods may sound adequate to prevent from getting the disease, they aren’t. You are bound to make a mistake, not do good enough sanitization every now and then. Just think how all those medical workers got infected. E.g. the one in Spain, a nurse in a hospital treating a single infected patient. For sure they knew how to sanitize and what protocols to use to avoid the infection. They had equipment that normal people won’t have easy access to. Still… Of course, the chances getting the infection with proper care is a lot lower than say in Africa, but still one has a lot to lose. Wow… I’ll have to stockpile aluminum foil now so I can make hats to block the brain scanners. I hope they took down the names of the 100 people that went to that seminar and put them on a watch list for mass shooting attacks or general Wacco Texas behaviors. Surely the WACO behavior you speak off was the government murder of numerous men, women and children. 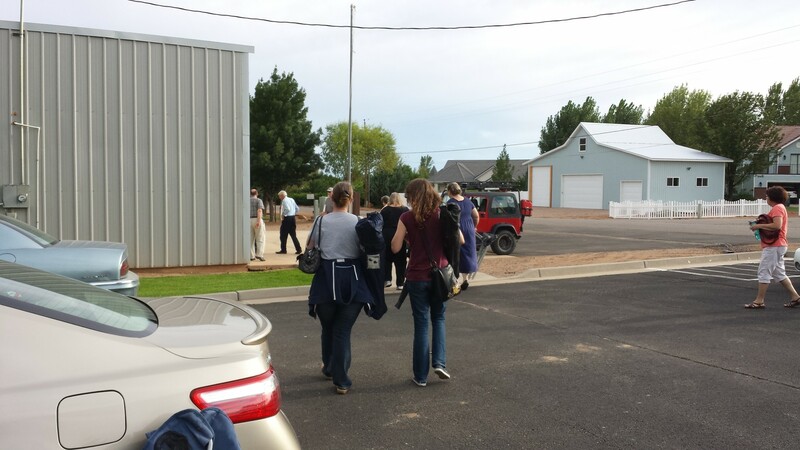 People of “interest” could have been arrested OUTSIDE of the compound, but FEDS were lazy, and Janet was crazy. I found this article very interesting. I personally go with “the better safe than sorry” motto. Being prepared for an emergency is a very good idea. If you’re able to go ahead and stockpile enough food, water and whatever else you need to survive for a few months. It’s not like you’ll throw it out if some catastrophe doesn’t happen. Protection of property and self? Seems like a good idea to me. While it’s great to be self sustaining in the event of catastrophic events, it sounds as if this meeting was more of a scare tactic to get those in fear of the apocalypse to buy supplies from the presenter. Maybe I’m off base, but the rhetoric here seems violent and and intended to incite an unnecessary fight or flight response from attendees. Civilization is a choice. Make it. Soon. Ebola… gets rid of african parasites like magic! And the racist hillbilly creep weighs in with his thoughtful insights. Get off the computer VARIOLA, there’s a Here Comes Honey Boo Boo marathon playing on the television — you’ll not want to miss a second. THE QUESTION YOU HAVE TO ASK YOURSELF: “DO I HAVE ENOUGH GUNS AND AMMO TO SURVIVE THIS?” OBAMAS COMIN’ TO TAKE OUR GUNS!!!!!!!!!!!!!!!! IT’S A MUSLIM SOCIALIST CONSPIRACY!! AND DON’T FORGET ABOUT BENGHAZI!!!!!!!!!!!!!!!! Interesting, but why not just cure it. the information is out there. try reading about ozone, colloidal silver, electrocuting viruses, herbs and plants, but there is no money in a free cure. This article does strike me as much more inflammatory than helpful.